Don’t you love the bright colors! Spot On was inspired by the “New Dots” pattern from 1967. I was actually around in 1967 and remember it! What a fun blast from the past! All the Vintage Charm sets are inspired by beloved designs of Pyrex opal glass bowls from the 50’s and 60’s! They have been updated but still have that amazing vintage feel! Wouldn’t these bowls be such a cute hostess gift this holiday? I’m taking cookies to a Holiday Cookie exchange in another Vintage Charm set! I think my gingerbread men will look adorable standing in these bowls? Vintage Charm would make a very sweet Christmas gift too! Who on your gift giving list would love these bowls? You can find Vintage Charm inspired by Pyrex HERE. And receive 20% off your Vintage Charm purchases at ShopWorldKitchens.com. Just use the code VINTAGE20. You can also find Vintage Charm at Target, Macy’s, Walmart and Amazon! Vintage Charm bowls come in a set of three or 6 (lids for bowls) and come in different patterns… but my favorite is Spot On! You can see the other patterns HERE. This website is a must see! So kitschy yet modern… and I love the video! Ready, let’s get started and make a Christmas arrangement! *use your imagination and decorate your arrangement the way YOU love! Stack the large and medium bowls as shown above. Put a small bowl or cup in the bottom of the largest bowl to prop up the medium size bowl. Make sure the inside bowl/cup is big enough so when the Vintage Charm bowls are stacked the colorful design shows. It’s all about those cute vintage designs! I added a few pinecones around the base of the cup in the large bowl as a filler. This is optional, but it really saves on greens! Stick greens into the bottom bowl so they fill the gap between the bottom bowl and the middle bowl. Make sure they are short enough that most of the vintage pattern is showing. At this point just add evergreen sprigs… no other greens or decor. 4. Stack the small Vintage Charm bowl into the medium bowl the using instructions 1 and 2. 5. Add greens around the base of the medium bowl. 7. Embellish with other greens and little ornaments. Now all you have to do is light the candle! So easy and such a pretty arrangement! This cute post is sponsored by Vintage Charm inspired by Pyrex. LOVE these bowls! This is something I could make for my daughter as she loves vintage and she would find a perfect place in her home to display. Love this idea and it is so easy! Thank you !!!! And the bowls are easy to find and quite reasonable! Welcome to the StoneGable family, Lisa!!! I’m so thrilled you are enjoying StoneGable. I love these bowls. I had a set of Crazy Daisy Cinderella nesting mixing bowls as well as some casserole dishes of Crazy Daisy. Unfortunately, hey have not managed to survive moves, children, and divorce. 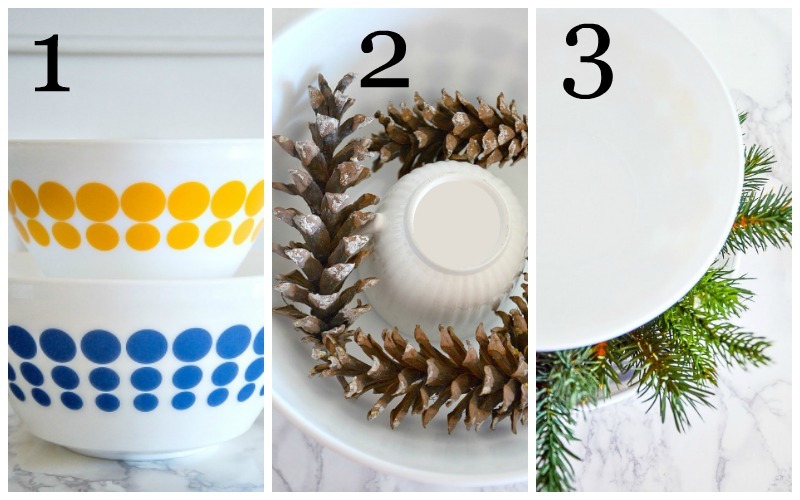 Love the idea of fixing the bowls for a Christmas design! Awesome job. May have to do some searching on Ebay. I absolutely love this website and especially the tutorials you have on here. It makes things must easier to be able to see how it is done without having to go to several different pages. This is a great idea to get those old bowls out on display! Thanks! Very cute. I still have my yellow stacking square Pyrex set from 1971. Love it. Once again~ you’ve inspired me! Merry Christmas to the Pratts. R his is a great idea! Vintage+ Christmas=adorable! Sausage and egg breakfast casserole made the night before Christmas morning. A big pot of coffee, assorted teas, bagels, muffins and toast at the ready and I’m all set. Birds of a Feather pattern is my all time favorite and it is impossible to find in consignment and thrift shops 🙁 ! I love decorating ideas using everyday items in the home. My favorite pattern is Birds of a Feather. I can picture lots of greenery, red baubles and black and white ribbon! That is just fun in a refreshingly unexpected way. Such a cute idea, Yvonne! My favorite recipe for the holidays is sugar cookies. Thanks for the giveaway. I love Tickled Pink. 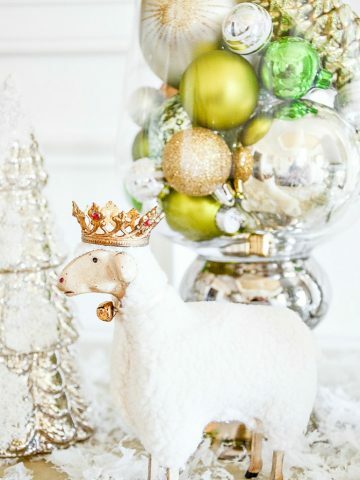 What what a cute and oh so cleaver Christmas decorating idea! I love the rise and shine pattern and color! I would place my favorite Coconut Snowball Christmas cookies in the bowl!!! So inspired by stacking bowls! 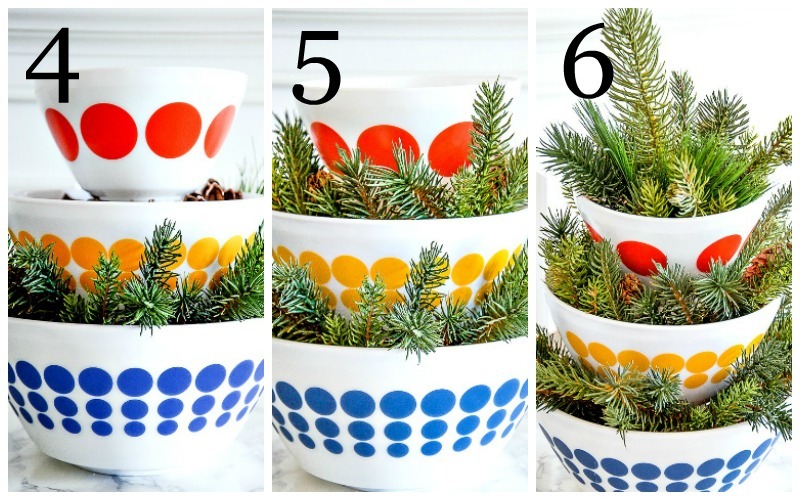 Love these old Pyrex bowls and your ideas using them to decorate with. I like “Birds of a Feather” – it manages to be retro and modern at the same time. I love cooking the traditional Italian Christmas dinner my mom always made – homemade sauce, meat and cheese stuffed jumbo shells and bracciole (steak roll)! So blessed to have family around to share the bounty! These patterns really take me back to the days of watching my mom in the kitchen! I still use Pyrex bowls – couldn’t be without ’em! Hard to choose just one of the Vintage patterns; they are all adorable! Thanks sooo much for sharing about Vintage Living, I’m in love! I love vintage! I kick myself often for letting Mom’s vintage pyrex get away! So now, I might get to start over! So cute and so cheery for the season! My favorite Christmas recipe would be my mom’s Tie Dye Brownies. Very simple but delicious, a family tradition and are now requested whenever we attend other gatherings. I really like the Rise ‘N Shine pattern; it reminds me of the vintage Butterprint Pyrex my grandma had. 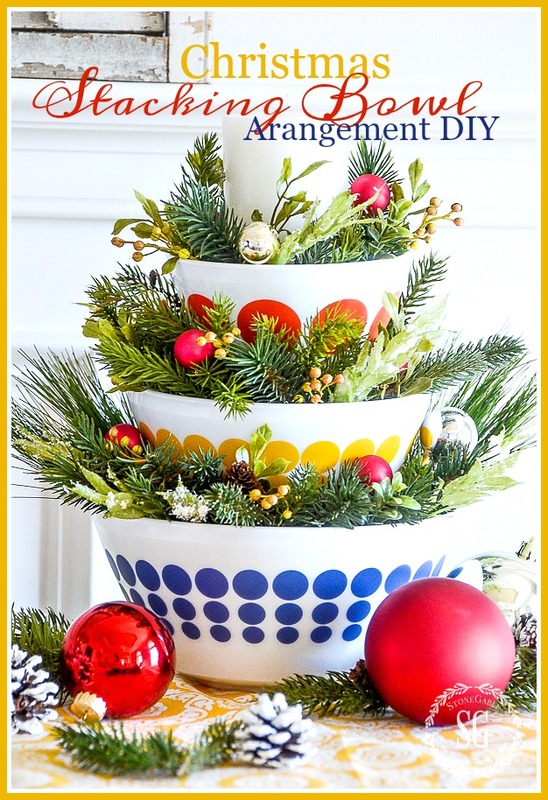 Stacking the bowls like you have is such a cute idea for Christmas decor in the kitchen; thanks for the idea. Such a cute idea! Love it when you can take something from around the house and use it in such a special way. Darling idea stacking your Vintage Charm bowls with greens and things. Also perfect and so festive filled with 3 different cereal snack mixtures. “Oh how I love CHRISTmas”. 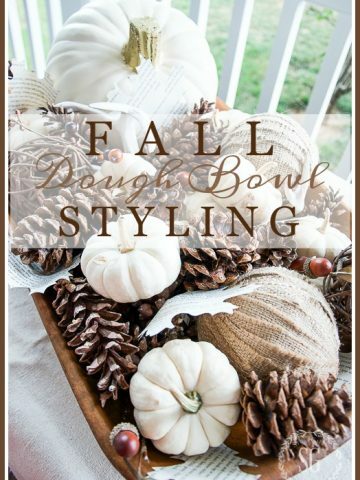 What a fabulous way to decorate and display your bowls all at the same time! Love it! Oh Yvonne, how charming. My daughter has my Mother’s original Pyrex bowls, with fruit on them. I’ll forward your idea for sure! My mom had Pyrex baking dishes in brown and white and gold and white, Thanks for the post, it brought back a lot of good memories of my Mom and her delicious cooking. I love all things vintage and the little girls in the video remind me of my girls back then. Isn’t that video so adorable! Kitchens highly deserve special decorations during the holidays…after all, kitchens are where it all happens! The Pyrex inspiration is perfect…here’s to our Christmas kitchens!? What a novel idea! I love Pyrex! I have both of my Mother’s sets (bowls & containers) and as a result, I’ve yet to purchase a set! I just love visiting your site, I always feel so inspired to try some new decor ideas! I love the Tickled Pink pattern, I really like them all! I like the pattern called Tickled Pink. What a wonderful idea! I bought a set of cherry mixing bowls at Cracker Barrel a few years back and they would be darling with this idea. I have a few or aments left so now to find some greenery. Thanks for the inspiration. PS Wish I had room for the retro bowls I saw them at Target and they are so much fun. I enjoy making my Coffee Cashew Biscotti for family and friends at Christmas. The Memory Lane print is my favorite! Very cute!! I dare not enter the giveaway, tho’ as I have more bowls than I have cupboards for already! The Birds of a Feather is my fave! Great giveaway and blog! Love the Pyrex bowls. I have some that were my Moms. Cute in 1967, and even cuter today! Love all the bowls. Great idea. What a quick and pretty idea! I’ll be using it all through the year!! Thanks for sharing! I love Pyrex bowls and have some we received as a shower gift many years ago, these new colors are amazing! I too was around in 1967. Love all of your ideas Yvonne. I especially like the Rise and Shine pattern. ? What a great idea for a Christmas kitchen decoration. I have a gingerbread theme in my kitchen so I could imagine some cute little gingerbread people tucked into the greens. I too was around in 1967. Love all of your ideas Yvonne. I especially like the Rise and Shine pattern. I think my aunt my still have something similar in her vintage Pyrex collection. ? My favorite recipes is my nanas tamale recipe. Nothing taste like hers. OH, I’d love to have that! My favorite pattern is vintage charm. Such a cute idea. I love Birds of a Feather! I love the Spot on bowls. They take me back to my childhood! Oh boy this takes me back! Memory Lane would be my pick!! Thanks for all of your wonderful Christmas ideas! What a truly lovely idea! I love it! Our Story is my favorite design. Love the red – perfect for Christmas. A cost effective arrangement that is so pretty too…. I love the Spot On. Have always loved polka dots. Besides, my son-in-law’s family is British & that’s a familiar phrase. What a great idea! I have a set of stacking bowls that would be perfect for this project! I like the Vintage Charm. All are beautiful! I love these bowls. I have the “Rise N Shine” 6 piece set, and I have the “Tickled Pink” to give for a gift. 😉 I inherited my mom’s vintage Butterprint casserole bowls (lots of fond memories and use of these bowls while growing up… can’t believe we never broke them! ), and I have been trying to add on pieces to it. The Butterprint is pricey! Love your arrangement idea! Just love this! The best thing about “new vintage” is it can be put in the dishwasher. I have accumulated a few pieces of vintage and I hand wash those suckers. It does not keep me from using them though. Love the Rise N Shine pattern. Love this idea! I’m all about Christmas decor all through the house. I’ve also seen one done with stacking flower pots to use in a sun room. Tooooo cute, I love those bowls! I too remember that pattern! Who wouldn’t love that cute centerpiece?? My fav Christmas recipe is homemade caramels, recipe I’ve made since the early 70s for my boys! I still have my set of Pyrex bowls that I received as a wedding gift many! many! years ago. Over the years, I have collected several other sets and love all of them. I think Memory Lane is my favorite. Love all of the designs, so hard to choose! Love your blog too, thanks for your inspiration! 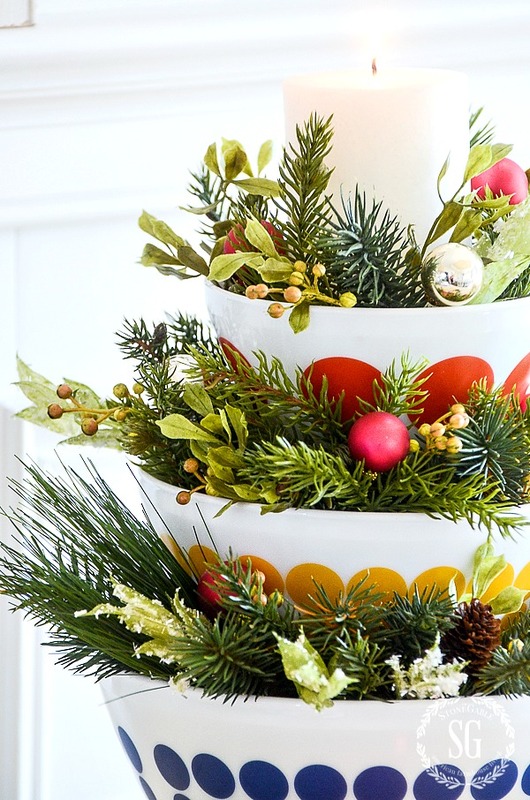 What a darling and simply Christmas arrangement! Love it. I have Pyrex bowl that was my ,mothers; I think its a Harvest Wheat pattern ( not sure of the correct name)…I’ve collected the other sizes of the Regular and Cinderella style bowls – I use then daily! 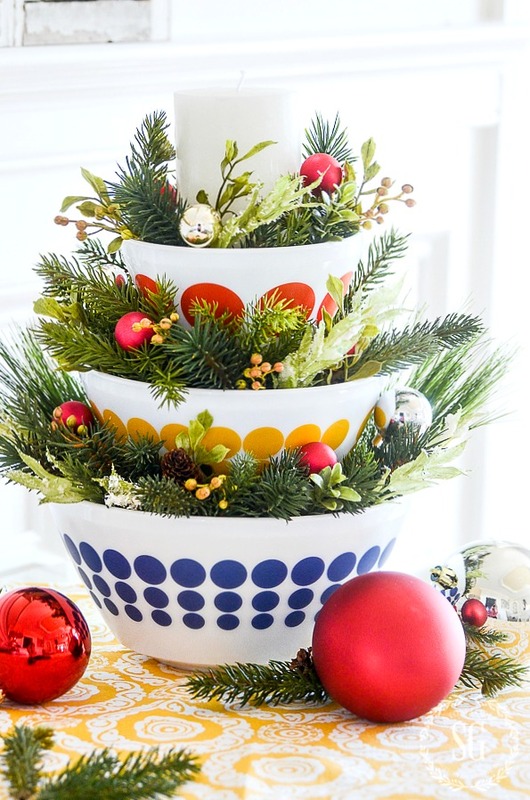 I love your idea for decorating the stacking bowls, and I’m going to give that a try! Thanks for ongoing inspiration! Hint – The colors stay nicer if you don’t put in the dishwasher! All beautiful. The backbone of a working kitchen. My favorite, hard to decide, is Memory Lane. Thank you and Merry Christmas to all! All of the designs are so cute! 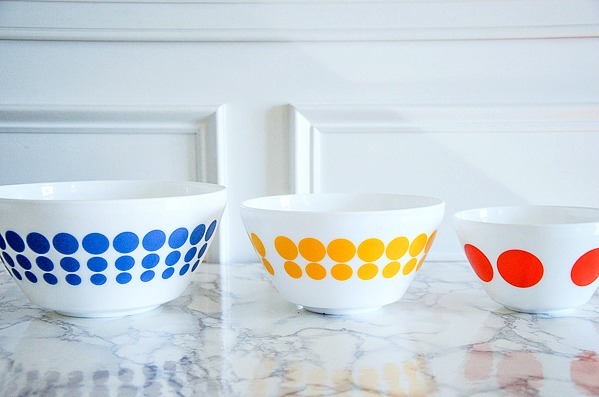 I love what you did with the Dots bowls. I guess if I was forced to pick a pattern it would be Rise ‘n Shine. I have always loved the original amish design. But boy they are all so cute! I’ve seen a little bit of this at Target but didn’t realize there was such an extensive line. Thanks for the inspiration, it will be a good excuse to use more of my blue and white china. Love Golden Days and Tickled Pink. I would put my Christmas Cheese Ball in the smaller bowl. Combine two 8 oz. softened cream cheese (the full fat kind) with three chopped green onions, including the green part, one jar of dried corned beef, chopped, and one half to one teaspoon Accent (found in the spice aisle by the salt). Clean your hands really well, squish all incredients together, and form into a ball. I like to reserve a couple pieces of dried corned beef and cut star shapes to garnish the top of the cheese ball. It is simple and soo yummy! I’m pulling out my Nana’s crockery mixing bowls today and making an arrangement for the kitchen! Thank you for the wonderful idea! What a cute and imaginative idea! Absolutely love http://www.shopworldkitchen.com/rise-n%27-shine-3-pc-mixing-bowl-set-inspired-by-pyrex/1119311.html#sz=23&start=13! So cute. I have my grandmother’s vintage pyrex and I really treasure it. So beautiful. Oooooh – these fit in perfectly with my love of 60s and 70s design. The colorful and simple memories of my childhood! I love Golden Days and Spot On the best. I love and collect a few Pyrex bowls. My Mom’s big yellow bowl holds many memories! I use all of my vintage bowls for everyday! Love vintage bowls.This is a cute idea and so simple. chip cookies.I make them every year. Yvonne, You never cease to amaze me. Creativity pours out of you. I am going to do this! 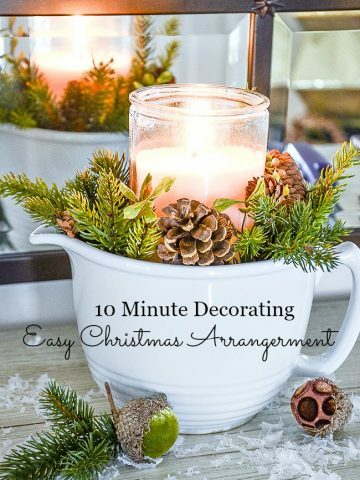 What a neat idea to use some of those pretty bowls I have here at Christmas time. Thanks for sharing Yvonne! Merry Christmas! I love Memory Lane. It matches my brightly colored kitchen very well. I have a couple of old bowls in solid colors from my mom! Love “Birds of a Feather” pattern. I’ve had this idea from a number of years but have never done it. I have a set of green bowls by Hall Pottery that would be perfect for Christmas. Thanks to you I must do it! Thanks for the nudge. Like the use of vertical space for kitchen, to spare counter space and still have beautiful Christmas decor. We still use our white, with cornflower blue flowers, coffee pot, as well as bakeware. All were wedding shower gifts from 1972. Were Corning and Pyrex the same manufacturer? I love the Tickled Pink! I love that your ideas are not too complicated and you explain the directions so well. Thank you! This is the cutest and most clever idea!!! Love it! Thanks. Such a cute idea and I have one of the original Pyrex bowls already..
Oh, what a hard choice. I like them all, but I think Tickled Pink is my favorite. Thanks for the chance to win. I remember 1967! I was five. But I love anything with vintage charm, I’ve been collecting some of the Pyrex anniversary items, and I love anything that looks vintage Pyrex! I have my mother’s Corningware, the white with the blue flowers that everyone had. But I’ve always loved Pyrex. They have some vintage ones in pink that I would totally collect if I had the storage space! These are great, and what a cute idea stacking the bowls with greenery and a candle. I want to do this in my kitchen, I absolutely LOVE it! I actually still have one of my original bowls, the 4 qt. orange one. I like the golden set and hope I win. Really cute. I also loved Tickled Pink. It has sort of a Scandinavian feel that would also tie in with Christmas. And I agree…that video is so darling. I loved the background song! 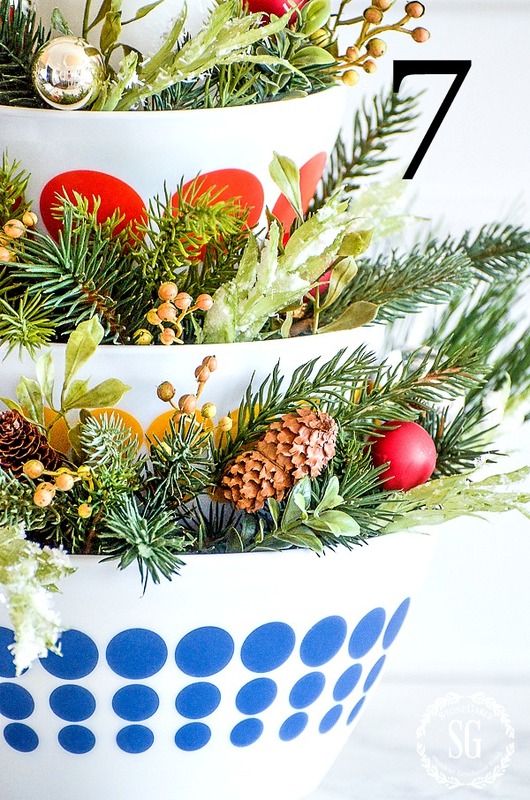 May I suggest using wooden bowls with greens and berries for a colonial touch or baskets. Your ideas are always wonderful Yvonne! Merry Christmas!! Tickled pink is so cute! I am ashamed to say I am using old plastic stacking bowls I acquired years ago. Wow, how we get stuck in ruts! I have one good glass bowl that I use regularly because it scraps down so much easier and doesn’t get greasy like the plastic ones. With that said, why don’t i get some new bowls? I DON’T KNOW, but it sure is time. I do believe rise N shine is my favorite! Getting these for my girls Love them! I’m with you, Yvonne! I love the cheerful, sassy Spot On. I’m definitely old enough to remember these patterns! As you do every time I read your blog, you put a smile on my face. You are a blessing! Love these! I can see myself doing these for other occasions too! I like the dual purpose of items with the bowls. Vintage and retro items are in. Oh my goodness! I absolutely love this! I am going to start looking for these bowls as soon as I finish leaving my comment. Thank you once again for this idea! I love all of your Christmas ideas……..so lovely and also do-able. What a lovely arrangement and so creative. I love those bowls. Brings back memories of my Mom. I only have one left now. Took a peak at the website and I’m drawn to the “Birds of a Feather” set. This is an adorable idea! I can’t wait to try this with some of my vintage bowls! My mother and grandmother were proud owners of many Corningware and Pyrex products, and, started me on my collection many years ago. Some of my favorite pieces are the mixing bowls! And, my favorite piece is my grandmother’s small Corningware teapot with the chickens and a tulip in the middle! I love seeing it every morning! Thank you for your blog that reminded me of my many memories of these two wonderful ladies! I bought one of the new teal bowls to go with my vintage set. This will be a great way to utilize them for Christmas too! What a great idea! You are so creative. The vintage patterns are wonderful. My own Pyrex set is 30 plus years old and I use them every day. So creative and charming Yvonne. This idea would be lovely with some of your well-loved white ironstone bowls too. I almost deleted this post because I am So. Saturated. With Christmas DIY. Glad I didn’t! What a clever idea, and I had never heard of this line of Pyrex. Love the Spot On. Great Job! I love ideas using things we have and love. The possibilities are endless. I was around in the 60″s also and remember these vividly. I love them all but birds of a feather and rise and shine are my favorites today! Cute cute idea! Great Idea!! Especially the gingerbread men idea! I have a set of Christmas-attired Teddy Bears, and this bowl idea will be perfect for the display. Fa lal la la la! What a sweet arrangement. I, too, like the Spot On – so fun! Thank you for your many creative ideas. HOW do you think up all these awesome ideas???? Love it!!!! Now I know what to do with my favorite bowl set!! Merry Christmas!!!! What a great idea! I love my vintage Pyrex bowls, they were my aunts and I think of her everytime I use them. Cute idea. It is very colorful and Christmas looking. What a cute idea! Love using things I already have to make new arrangements. I love this blog for inspiration! I use my 38 year old Pyrex bowls often. These are adorable. I will have to look for them on Amazon!! Loved this idea, polka dots are my favorite, have a set of red and white , will be perfect..another winning idea thank you ? Oh the wonderful things my mother made in her Pyrex bowls of green, yellow, and red in tree different sizes. Your darling arrangement is so imaginative and clever….love it! Rise n’ Shine is my favorite pattern. Reminds me of my Grandmothers set my daughter inherited. Yvonne Have a Beautiful Week. Memories of my mom’s Pyrex bowls being used everyday-meal prep, baking, you name it, probably did it with a Pyrex bowl. Still in use today at mom’s. Love this updated look on a classic pattern. Beauty in simplicity! Bonus of sweet memories!!! Thank you!!!!!! Well how creative you are- luv it! The Spot On would work well in our kitchen. Thank you. What a sweet video -I’m in love with the Rise and Shine pattern ,even though the colors in Birds of a Feather would match my kitchen better ……I have to go with my “heart” it’s Rise and Shine for me . They just make me happy every time I look at them. Thanks for sharing these. Favorite holiday recipe? Would probably be a dessert – chocolate cherry cheesecake! I love them all. If I had to choose one I guess I would go with Tickled Pink! I am very fond of that pattern too! My favorite recipe is homemade fudge with lots of nuts. Tickled Pink is adorable! Thanks for the chance to win such charming bowls! Wow, was I young and stupid! I realize now that I shouldn’t have put my Spring blossom green Pyrex bowls in a garage sale! Guess I need to buy some, but they won’t be Yintage! Really sweet project!! You always have such great ideas! Love this idea. Yes the Pyrex lasts forever unless you break it. I dropped a dish recently that I had had for years. It hit a cement floor. Darn it! I have replaced it with another Pyrex dish. I also have some of my Mother’s corning ware that I use almost daily. Have wonderful holiday ! Tickle Pink is my favorite selection. The Rise and Shine is the one for me. We live in wheat country and it fits in so well with this part of the country. I still have some pyrex bowls that are over 50 years old and I use them on a regular basis. Although I am down to two from a set of five, and the colors have faded over the years they are some of my favorites. So cute! I like Memory Lane and Rise N Shine the most! How cute! 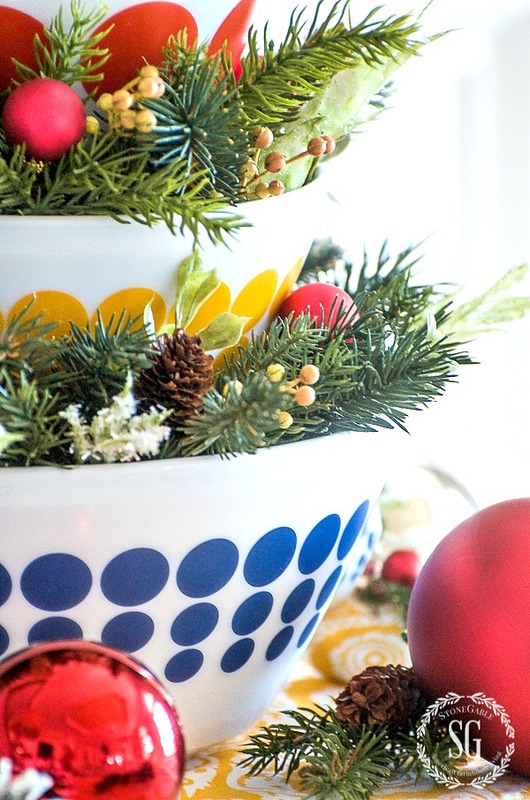 Love the idea of using the bowls — would you believe I have 3 Christmas green glass bowls. 🙂 Thank you for the idea!! Forgot to add — Golden days. The color makes me smile. Love this…simple and beautiful! My favorite pattern is Golden Days… reminds me of my mom’s!!? 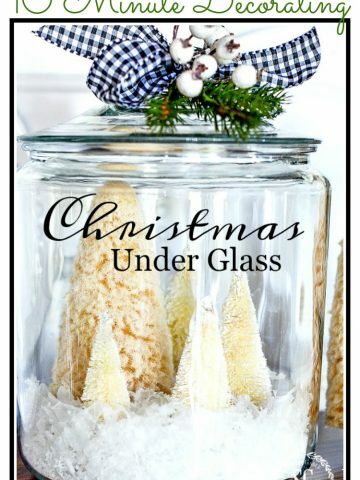 I really loved this idea and will be using my Williams Sonoma Melamine bowls instead and my glass prep bowls for the inside holder! love those Pyrex designs…happy you chose those! So simple and clever. I like the spot of color and the bowls are simply charming. Love the Pyrex, my favorite pattern is birds of a feather. Now that’s darn cute!! Thank So! You could do this with a lot of different bowls…..or even something square like nested trays…but I think round would look best. Memory Lane is my favorite. Grind fresh cranberries, fresh orange segment and sugar. Mix for the best holiday condiment. Use on sandwiches or to top vanilla ice cream. Thanks for sharing this easy and yummy condiment! YOU ROCK!!!! So cute! Love the Spot On and Memory Lane designs! However, back in the day, I remember owning a set similar to Golden Days! Thank you for sharing with us. Ok that is totally adorable!!! Great imagination Yvonne! I hope you do Karen! YES! I have the perfect bowls for this. Thanks, Yvonne, for sharing your creativity. So stinkin’ cute. Pulling my bowls out right now and doing the same!! ?? I like Memory Lane the best! I was around in ’67, too! Thanks for the giveaway! Great idea! Thanks for sharing. I like the rise and shine. Favorite Christmas recipe has to be my mom’s gingerbread cookies. We would all spend a December evening decorating these together and I have the fondest memories from these times. Gingerbread is such a favorite here too! I bet making it in Vintage Charm would be so nostalgic! Birds of a Feather…love this one! I love this idea, and so easy, which is just what I need! Thanks! I love those bowls too. I have my moms with aqua around rhe edge but I forget the design. Horses and carriages maybe? You have such a prize. I wish I would have my moms! Pyrex lasts forever! Lovely! I am making one. I’m so glad Kathy! You will love it! Happy Holidays and Merry Christmas Paula!